U.S. equities ended the quarter down 6.44% — the worst quarterly return since the third quarter of 2011. 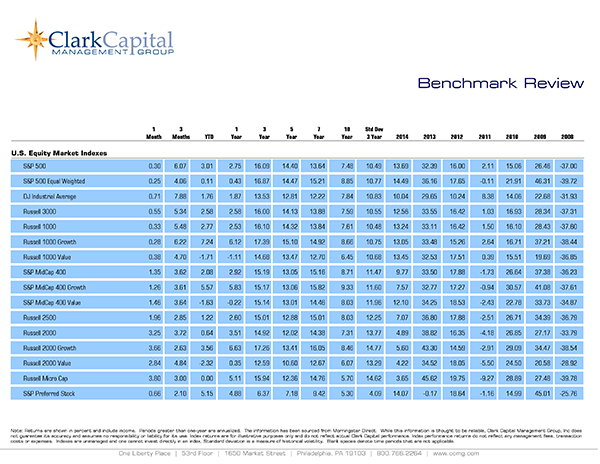 One interesting aspect of the markets this year is the underperformance of value compared to growth. The Russell 1000 Growth is outperforming the Russell 1000 Value index by 7.42% year to date. After showing brief signs of life in the first half of the year the international markets significantly underperformed the U.S. in the third quarter (MSCI EAFE -10.23%, MSCI Emerging Markets -18.53%). The Barclays U.S. Corporate High Yield Index (-4.86%) also had its worst quarter since the 3rd quarter of 2011. Treasuries were up across the yield curve with the 10-year U.S. Treasury 2.92% for the quarter. This highlights our conviction that a tactical approach to fixed income should be a part of your fixed income asset allocation.